Hands-on: The future of Android tablets? I have been walking around the halls of CES 2017 for a few days now, and there’s pretty much a new product in every category. TVs, phones, fridges, washing machines, cameras, watches and so on; but there are barely any tablets. I haven’t spotted a decent Android tablet anywhere. Now is the time to admit that Android tablets in their current form are dead. And that’s not a bad thing, because they’re mostly pretty underwhelming. Google Pixel C and a couple of Amazon Fire tabs aside, there’s simply no reason to upgrade if you already own one. But the future of Android tablets is here. And it’s Chromebooks, just like this one from Samsung. Samsung has unveiled two Chromebooks at CES 2017, but the only thing differentiating the Pro and the Plus is that the latter uses an ARM processor rather than Intel Core M. Everything else is the same. That means you’ll get a magnesium alloy laptop, with a 360-degree that flips the screen round and into a tablet mode. It looks fine, nothing sublime, but it’s light and importantly feels well made if a little on the plastic side. The hinge seems smooth and it’s not too thick when using it in tablet mode, something I often find with these hybrids. The rounded sides give way to a decent port selection, and it’s almost laughable to think this Chromebook has more ports than a 12-inch MacBook. A USB-C port adorns each side and while neither is Thunderbolt 3-enabled, both can be used for charging. There’s also a headphone jack, microSD slot and a little cubby hole for the included digitiser stylus. The passive stylus here reminds me a lot of the S-Pen from a Galaxy Note, and it works in a similar way. It doesn’t need to be charged, or manually connected, but still feels accurate and responsive when drawing or taking notes. The 12.3-inch, 2,400 x 1,600 display is the perfect canvas for the pen. Like pretty much every Samsung screen it’s stunningly colourful, with 400 nits of brightness and great contrast. There’s a nice balance between saturated colours and accuracy, which makes this ideal for media and games. But what really makes this Chromebook stand out is how well it works the Google Play Store. It’s not the first to have access to Google’s store of movies, apps, games and music but it’s the built specifically for it. Navigating the store feels like you’re on a phone, but apps themselves open in windows – rather than taking over the whole screen – so you can open multiple at once and spread them out over the display. It’s so much less restrictive than your typical Android tablet. Apps are smooth too, and the Pro model with an Intel m3 CPU handled everything I threw at it with ease. I tried the Plus version as well, which uses an unnamed ARM chipset and will cost $449, and it equally seemed nippy. There’s 4GB RAM and 32GB of onboard storage. Samsung claims both models will get 10 hours of use on a single charge, and the models I was testing showed 5.5 hours remaining with 50% battery left. My only slight issue is with the keyboard and trackpad. Neither struck me as excellent. The keyboard is fine, but a little bit mushy and soft while the trackpad is sticky and not terribly responsive. I’ll have to use the device a bit longer to know whether these will be dealbreakers. 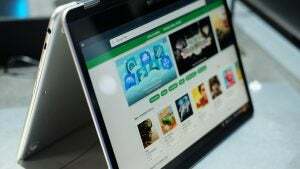 There’s a lot to like about Samsung’s new Chromebooks, and I think they’re the perfect Android tablet replacement. The screen is great, battery seems decent and there’s enough grunt under the hood to get the job done. Let’s hope Samsung decides to bring them to the UK. The post Samsung Chromebook Pro appeared first on Trusted Reviews.